This name uses Portuguese naming customs. The first or maternal family name is Fernandes and the second or paternal family name is Santos. Cairo Fernandes Santos (born 12 November 1991) is a Brazilian-born American football placekicker for the Tampa Bay Buccaneers of the National Football League (NFL). He played college football at Tulane, and was signed by the Kansas City Chiefs as an undrafted free agent in 2014. Santos also played for the Chicago Bears and Los Angeles Rams. He is the first Brazilian born player in NFL history. Born in Limeira, in the state of São Paulo, Brazil, and raised in Brasilia, the capital, since 4 years old, where his father worked as a pilot for Varig. Santos was unfamiliar with American football until he moved to St. Augustine, Florida, as a foreign exchange student. Originally, Santos planned to stay at St. Joseph's Academy for one year to learn English, but soon found that the kicking skills he had developed playing soccer in Brazil translated well to field goal kicking in American football. With the opportunity to earn a college scholarship, Santos remained in Florida, sharpening his kicking skills through high school. The 2012 was a breakout season for Santos as he went 26 of 27 on PATs (his only miss was blocked) and a perfect 21 of 21 on field goals, including a school record 57-yard field goal. He became only the second kicker to make at least 20 in a season without a miss. 12 of those field goals were from 40-plus yards and 2 from 50-plus and 31 of his 55 kickoffs went for touchbacks. At the end of the season, Santos was named consensus All-American and received the Lou Groza Award for the nation's most outstanding placekicker. Santos went on to compete in the 2014 NFLPA Collegiate Bowl, where he connected on a 39-yard field goal and recorded one tackle on a kickoff return. Santos was signed as an undrafted free agent by the Kansas City Chiefs on 19 May 2014. He was named the Chiefs kicker on 30 August 2014, beating veteran Ryan Succop for the position. On 7 September 2014, he became the first Brazilian born player ever to play in an NFL regular season game in a 26–10 loss to the Tennessee Titans (which was also the team of the kicker Santos replaced), also kicking his first career field goal. After missing two field goals in his first two games, he made his next 13 field goal attempts, including a clutch game-winning field goal with 26 seconds left in a Week 7 win over the San Diego Chargers and a 53-yard field goal the following week against the St. Louis Rams. Santos was the team season scoring leader (113 points), with the most points by a rookie player in Chiefs history. He also made most field goals (25) by a rookie kicker in Chiefs history (tied with Ryan Succop). Both rookie records have since been broken by Harrison Butker's 2017 season. In a 21–36 loss to the Cincinnati Bengals on 4 October 2015 (Week 4), Santos kicked a team record seven field goals, including two over 50 yards. His seven field goals in the game is the second most all-time in a single game, which he shares with five other players. The points scored by Santos in the game were the only points scored by the Chiefs during the game. In Week 15, Santos kicked a 53-yard field goal against the Baltimore Ravens. This was the fourth field goal with at least 50 yards in the season (franchise record, tied with Nick Lowery). Santos was the team season scoring leader and sixth in NFL season. He also tied for fifth with most field goals made in NFL season. In a 30–0 victory against the Houston Texans in the AFC Wild Card game, Cairo Santos became the first Brazilian player to play in a playoff game. He made all three field goal and three extra point attempts. He kicked two 49-yard field goals, the longest field goals in the Chiefs postseason history. In his second postseason game, Santos made two field goals in a 20–27 loss to the New England Patriots in the AFC Divisional Playoffs game. In Week 2, Santos kicked a 54-yard field goal in a 12–19 loss to the Houston Texans, the longest field goal of his professional career. Santos made two field goals in the 30–27 overtime victory against Denver Broncos including a game-winning 34-yard field goal attempt that bounced off the left upright with five seconds left in overtime in Week 12. In November, Santos was named AFC Special Teams Player of the Month for the first time in his career after converting 11 of 11 field goals and all five extra points. Santos was the team season scoring leader and sixth in NFL season. He also was the seventh (tied) kicker with most field goals made in NFL season. After missing much of the training camp and the preseason with a groin injury, Santos returned in time for the start of the regular season. He started the season off on a strong note by converting all six extra point attempts in a 42–27 victory over the New England Patriots on Thursday Night Football. However, the injury was aggravated after a hit in Week 3 against Los Angeles Chargers. On September 26, 2017, the Kansas City Chiefs placed Santos on injured reserve. Santos made all the 12 extra-point attempts and was 3-for-3 in field goal attempts. On September 30, 2017, the Kansas City Chiefs waived Santos from injured reserve. On 20 November 2017, Santos signed with the Chicago Bears. Santos missed his first field-goal attempt as a member of the Bears, a 54-yarder. On 4 December, Santos was placed on injured reserve after hurting his groin in pregame warmups in Week 13 against the San Francisco 49ers. On 15 March 2018, Santos signed a one-year contract with the New York Jets. He was released on 22 August 2018. On 2 October 2018, Santos signed with the Los Angeles Rams to serve as their starting kicker while Greg Zuerlein recovers from a groin injury. In his first game, he made a game-winning 39-yard field goal in a 33–31 victory over the Seattle Seahawks. He was released on 16 October 2018 after two games after Zuerlein was deemed healthy. On 12 November 2018, Santos was signed by the Tampa Bay Buccaneers after Chandler Catanzaro was released. Santos in his team debut he was perfect on all five extra-point attempts in the 38–35 loss to the New York Giants in Week 11. In Week 15, Santos made his 100th career field goal in the 20–12 loss to the Baltimore Ravens. On March 13, 2019, Santos re-signed with the Buccaneers. In the 2016 "My Cause My Cleats" NFL campaign, Santos honored Chapecoense, a Brazilian association football club, due to the aircraft crash that occurred with the delegation of the club killing 71 people in Colombia on 28 November 2016. ^ "Cairo Santos Player bio". TulaneGreenWave.com. ^ "NFL International Series: Cairo Santos' journey from Brazil". BBC.com. 31 October 2015. Retrieved 17 November 2016. ^ Velasco, Leo (2 September 2014). "Após sonhar com 10 do Fla e do Brasil, Cairo Santos será 1º brasileiro da NFL". www.globoesporte.globo.com. GloboEsporte. Retrieved 22 February 2015. ^ Ferreira, Edmar (29 January 2015). "Limeirense da NFL treinará nas férias para melhorar chute". www.gazetainfo.com.br. Gazeta de Limeira. Retrieved 22 February 2015. ^ "Kicking it in America: How Cairo Santos turned a one-year stay into a possible career in the NFL". Yahoo Sports. 6 December 2012. 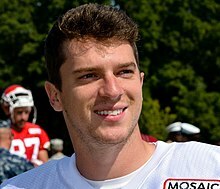 ^ "Cairo Santos". Tulane Green Wave. Retrieved 19 October 2014. ^ "Cairo Santos Bio – Tulane University Official Athletic Site". tulanegreenwave.com. ^ "College Football All-America Team 2012". SB Nation. Retrieved 19 October 2014. ^ "Tulane Kicker Cairo Santos wins Lou Groza Award". Nola. Retrieved 19 October 2014. ^ "Chiefs Sign Webb and Three Rookie Free Agents". KCChiefs,com. Archived from the original on 16 July 2015. Retrieved 20 May 2014. ^ "Chiefs rookie kicker Cairo Santos makes history for Brazil". KansasCity.com. ^ "Most points by a rookie Chiefs". pro-football-reference.com. Retrieved 31 October 2017. ^ "Most FG made by a rookie Chiefs". pro-football-reference.com. Retrieved 11 September 2017. ^ "Harrison Butker Stats, News, Videos, Highlights, Pictures, Bio". ESPN. Retrieved 21 February 2018. ^ a b "NFL Single Game Total Field Goals Made Leaders". pro-football-reference.com. Retrieved 4 October 2015. ^ "Most games 5+ FG season Chiefs". pro-football-reference.com. Retrieved 28 December 2017. ^ a b c d e "ALL-TIME RECORDS" (PDF). kcchiefs.com. Archived from the original (PDF) on 8 September 2015. Retrieved 21 December 2015. ^ "2015 NFL Scoring Statistics". nfl.com. Retrieved 4 January 2016. ^ "2015 NFL FG Statistics". nfl.com. Retrieved 4 January 2016. ^ "Brasileiro acerta tudo e ajuda os Chiefs a chegar à semi de conferência da NFL". globoesporte.com (in Portuguese). 9 January 2016. Retrieved 9 January 2016. ^ "NFL faz correção, e Cairo Santos tem confirmado recorde pessoal na carreira". globoesporte.com (in Portuguese). 22 September 2016. Retrieved 26 September 2016. ^ "Late turnover lifts Chiefs to 20-17 win over Panthers". foxsports.com. 13 November 2016. Retrieved 16 November 2016. ^ "Watch Cairo Santos bank in unbelievable winner off upright as Chiefs stun Broncos in OT". foxsports.com. 13 November 2016. Retrieved 28 November 2016. ^ "Marcus Mariota, Kirk Cousins among Players of Month". nfl.com. 1 December 2016. Retrieved 1 December 2016. ^ "2016 NFL Scoring Statistics". nfl.com. Retrieved 2 January 2017. ^ "2016 NFL FG Statistics". nfl.com. Retrieved 2 January 2017. ^ Kissel, BJ (26 September 2017). "Chiefs Place Kicker Cairo Santos on Injured Reserve, Sign Harrison Butker". Chiefs.com. ^ Smith, Michael David (30 September 2017). "Chiefs rule out Dee Ford and Mitch Morse, waive Cairo Santos". ProFootballTalk.NBCSports.com. ^ Mayer, Larry (20 November 2017). "Roster Moves: Santos replaces Barth as Bears kicker". ChicagoBears.com. Archived from the original on 23 November 2017. Retrieved 20 November 2017. ^ "Bears-Eagles: Recap, social media reaction". ChicagoTribune.com. 26 November 2017. Retrieved 27 November 2017. ^ Mayer, Larry (4 December 2017). "Nugent replaces injured Santos as Bears kicker". ChicagoBears.com. Retrieved 5 December 2017. ^ Lange, Randy (15 March 2018). "Jets Sign Placekicker Cairo Santos". NewYorkJets.com. Archived from the original on 18 March 2018. Retrieved 15 March 2018. ^ Allen, Eric (22 August 2018). "Jets Release K Cairo Santos". NewYorkJets.com. ^ Simmons, Myles (2 October 2018). "Rams Sign K Cairo Santos". TheRams.com. ^ "Signed this week, Rams kicker Cairo Santos gets a game-winning moment". ESPN. 8 October 2018. Retrieved 8 October 2018. ^ Simmons, Myles (16 October 2018). "Rams Sign WR Nick Williams, Cut K Cairo Santos". TheRams.com. Retrieved 17 October 2018. ^ Smith, Scott (12 November 2018). "Cairo Santos Takes Over as Bucs' New Kicker". Buccaneers.com. ^ "Buccaneers' Cairo Santos: Perfect in team debut". cbssports.com. 19 November 2018. ^ "Buccaneers' Cairo Santos: Regains confidence in Week 15 loss". cbssports.com. 17 December 2018. ^ Smith, Scott (13 March 2019). "Bucs Bring Back Kicker Cairo Santos". Buccaneers.com. ^ "Most field goals made, no misses, game". pro-football-reference.com. Retrieved 11 September 2016. ^ "Highest FG percentage Chiefs". pro-football-reference.com. Retrieved 24 September 2017. ^ "Most points in first three seasons Chiefs". pro-football-reference.com. Retrieved 11 September 2017. ^ "Most points by a kicker, game Chiefs". pro-football-reference.com. Retrieved 11 September 2016. ^ "Most FG made in first three seasons Chiefs". pro-football-reference.com. Retrieved 11 September 2017. ^ "Most FG made game Chiefs". pro-football-reference.com. Retrieved 11 September 2016. ^ "Most FG made game playoffs Chiefs". pro-football-reference.com. Retrieved 11 September 2016. ^ "Most FG made, no misses, game Chiefs". pro-football-reference.com. Retrieved 11 September 2016. ^ "Most FG attempted game Chiefs". pro-football-reference.com. Retrieved 11 September 2016. ^ "Most games 2+ FG season Chiefs". pro-football-reference.com. Retrieved 2 January 2018. ^ "Most FG made season Chiefs". pro-football-reference.com. Retrieved 28 December 2017. ^ "Most points by a kicker season Chiefs". pro-football-reference.com. Retrieved 28 December 2017. ^ "Most points by a player Chiefs". pro-football-reference.com. Retrieved 24 September 2017. ^ "Após superar morte do pai, paulista quer ser o primeiro '100% brasileiro' a jogar na NFL". ESPN. ^ "Em rodada com homenagens à Chape e neve, Brady se torna QB mais vitorioso da história". espn.uol.com.br (in Portuguese). 4 December 2016. Retrieved 6 December 2016.